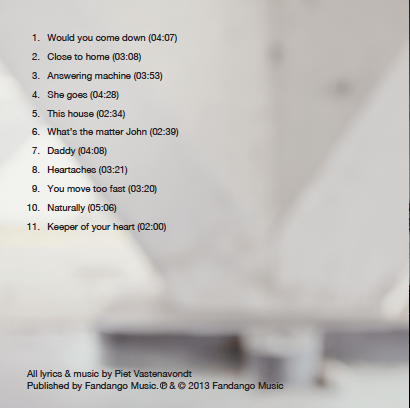 December 2013 - release of "I am Wilson"
"I am Wilson" is the first solo CD of singer-songwriter Piet Vastenavondt - Pete. Think of the sincerity and authenticity of Ryan Adams' lyrics, of the power and emotion of Jeff Buckley's voice, of Crosby, Stills, Nash & Young's harmonies. Combine all of these elements and you come close to singer-songwriter Pete. Piet has been writing songs for as long as he can remember. For his band and for other people. But for some of his songs, he just knew he had to release them himself. Piet: "It is sometimes easier to write about things than to talk about them. I also knew I had to sing these songs myself, they were not meant for anyone else. 'I am Wilson' is the album I have always wanted to make, but it had to feel right: the songs, the studio, the concept of the CD, ... I want that when people listen, they feel how real it is. And when they take away all the 'decoration', they realize that each song stands its own ground." Dirk (Studio Fandango): "The album is full of emotion and energy, the musicians have taken the songs to the next level and beyond, with the greatest respect for Piet and the songs. But don't be mistaken: when you listen to the extraordinary voice of Piet with just the acoustic guitar, you realize that this is a true album by a singer-songwriter pur sang." The musicians that have participated in this album: Bart Van Huyck and Ian McCole (electric guitar), Dirk Lekenne (Dobro slide & percussion), Luk De Graaff (bass) and Walter Mets (drums & percussion). The CD "I am Wilson" is available upon request, via iTunes and all other digital stores.